The third and final New Beginning show of the year this morning in Osaka will feature tow big title matches. 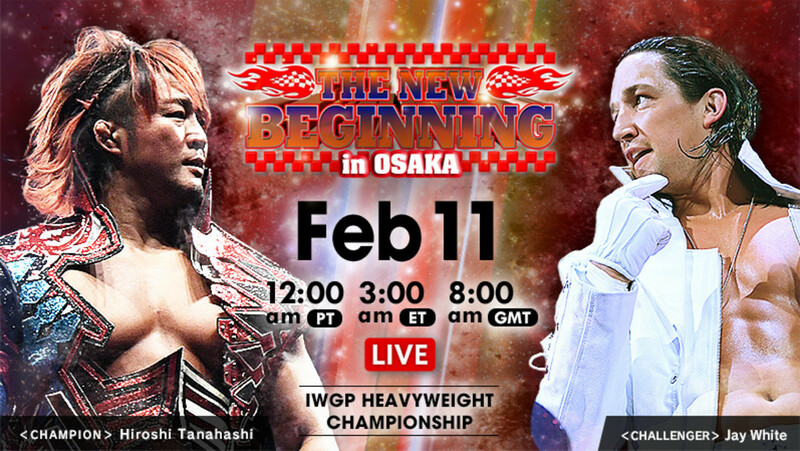 Jay White will look to upend Hiroshi Tanahashi's title run quickly, as he looks to take Tanahashi's IWGP Heavyweight title this morning. White has gotten the big push over the last year, restructuring the Bullet Club under his leadership and even getting Gedo to join his side. It will be interesting to see if he will continue this momentum tonight by winning the biggest title in New Japan. The IWGP Jr. title will also be on the line, with Taiji Ishimori scheduled to face Ryusuke Taguchi in this first title defense. In a special singles match, Kazuchika Okada will continue to do battle with the Bullet Club, as he faces a familiar foe with Bad Luck Fale. Join us this morning for live coverage starting at 3 a.m. Eastern. Don Callis and Kevin Kelly will be on commentary. TAKA took Iizuka's muzzle off, and Iizuka bit everyone. Liger and Suzuki traded strikes. Suzuki got a nearfall off a kick. TAKA got a tag and hit a shining wizard for a nearfall. Liger hit a shotei, and Kojima and Suzuki got tags. Solid match. Umino and Yoshida got a fair amount of offense on the tag champs, but they didn't tease an upset as heavily as they might have. The match was just okay. These guys have worked each other a ton lately, and there's only so much you can do to keep the matches fresh, especially when you're this low on the card. The post-match was good. Suzuki-gun jumped LIJ before the bell. Taichi used his mic stand and a chair on Naito. He ripped Naito's baseball jersey off. Naito's shoulders and left arm were heavily taped. Kanemaru hit a leg slice on Naito as he was draped over the barricade. He said he's in New Japan Pro Wrestling, he's not going anywhere. He announced that he's going to be in the New Japan Cup tournament. This was really more of an extended angle than a match. They sold this on commentary as a number one contender's match for EVIL and SANADA's tag titles. Tonga and Loa jumped Yano and Makabe on the ramp as they made their entrance. They fought into the crowd. Tonga emptied the contents of a fan's purse. Yano just beat the count back inside. Ishimori used a seated senton, then cranked on Taguchi's head with his legs. Ishimori applied a chinlock, but Taguchi reached the ropes. Ishimori avoided a pair of hip attack attempts. Taguchi hit a sweet dropkick, and Ishimori rolled to the floor. Taguchi hit a springboard plancha to the floor, a springboard dropkick back inside, then a tope con hilo. Back in the ring, Fale used stomps, and stood on Okada's back. Fale hit a series of forearms to the back, and Okada sold them big. Fale hit a backdrop, and Okada continued selling his lower back. White tried to escape, but Tana maintained the hold. White pulled the hair, backed Tana into the corner, and stomped on the bad right knee. White rolled outside and tried to post Tana's legs, but Tana posted him instead. Tana sent White into the barricade. Gedo hit him with a cheap shot. White hit an uppercut in the corner, then suplexed Tana into the turnbuckle. He posted Tana's right leg, then dropped Tana over the barricade onto a table. Tana beat the count back inside at 17. Tana hit a flying forearm, continuing to sell his right knee. He followed up with a somersault senton for a two count. He went for a cloverleaf, but White reached the ropes before the hold could be applied. Tana hit a dropkick to White's left knee. White cut a promo. He said he had his last Young Lion match in Osaka two years ago. He thought Osaka was his home, but he was wrong. None of the people there believed he could beat Tanahashi, but he did. He doesn't wrestle for the people, he wrestles for himself, Gedo, and Bullet Club. Breathe with the Switchblade, welcome to his new era.